ROARING!! with tomato sauce flavour that will leave you wanting more. 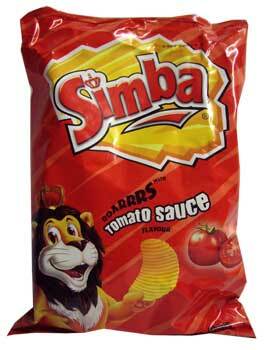 Simba chips are made from South Africa’s finest potatoes, which guarantee quality, fun, a great taste and sharing when a packet is opened. Potatoes, Refined Palm Oil (with Antioxidant (TBHQ)), Salt, Sugar, Acidity Regulators (E330, E262, E260), MSG (Flavour Enhancer (E621)), MSG (Flavour Enhancer (E621)), Maltodextrin, Spices, Colourants (E122, E172, E160(c)), Dextrose, Vegetable Oils (Garlic, Onion, Sunflower Seed), Anticaking Agent (E551), Flavourings (Soya, Wheat Gluten) Flavour Enhancers (E627, E631), Sodium Saccharin ((E954) Non-nutritive sweetener), Vegetable Powder, Onion. Food Colour(s) E122 may have an adverse effect on activity and attention in children. No-one does tomato-flavoured chips like South Africans!! Just the right crunch, saltiness and tomatoey flavour!